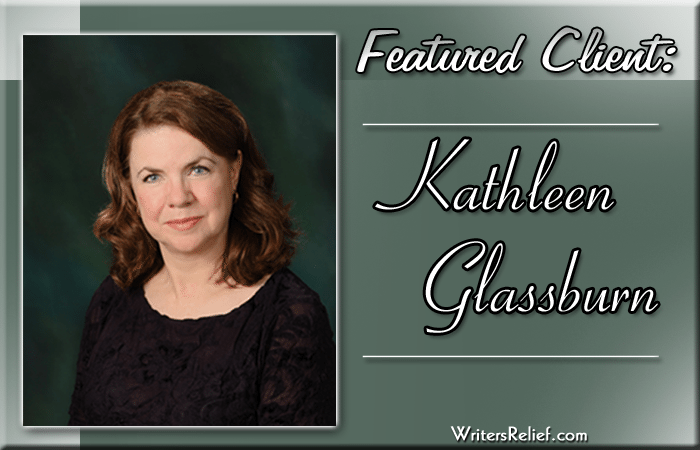 We are pleased to introduce our Featured Client Kathleen Glassburn! The managing editor of The Writer’s Workshop Review, Kathleen has been a prolific as well as successful writer. Kathleen’s writing has been published in Amarillo Bay, Rio Grande Review, RiverSedge, and many other literary magazines. She’s also been a finalist in Glimmer Train‘s Best Start contest. Researching places to submit my stories took valuable time that I wanted to use for writing. I sought out Writer’s Relief several years ago, and I appreciate the excellent job they’ve done targeting appropriate publications for my work. I’ve never had a problem with writer’s block (hope this remains the case), but rather my task has been to find the right words, eliminating extraneous ones. It has become one of my goals, at the suggestion of Writer’s Relief, to keep my short stories under 3,500 words for a greater chance of publication. Staying within this guideline has made me a stronger writer. While I continue with my novel-in-progress, another goal I have is to send Writer’s Relief one new or rewritten story each submission period. I’ve met this goal every year of our relationship, accumulating a large backlog of stories, many of which have been published. It’s hard juggling a novel and short stories, but with Writer’s Relief’s schedule in mind, I have been able to do both things. As an aspiring published novelist, I think it’s important to have short stories released while I continue writing my longer work. Self-promotion is difficult for me. This seems to be the case with many writers. However, in today’s publishing world, the necessity for this is a fact of our lives. Writer’s Relief helped me develop a website. It showcases some of my published work and is an immediate way to put myself out there. I reference it in the signature block of all my emails, and it is noted on my business cards. My Writer’s Relief team, through regular phone meetings, encourages me and provides suggestions for new ways to build my writing career. That said, they are respectful of where I am at the moment. I like having a group of people who are committed to my success, a group of people who understand how difficult this pursuit can be, a group of people who are making my writing life easier. Kathleen Glassburn graduated from the University of Washington with a BA in English, and went on to earn an MFA in Creative Writing from Antioch University, Los Angeles. She currently resides in Washington, with her husband, three dogs, two cats, and a 45-year-old turtle. When not writing or reading, she likes to play the piano and horseback ride. Her work has been published in Amarillo Bay, Blue Lake Review, Cactus Heart Press, Cadillac Cicatrix, Cairn, Crucible, Epiphany Magazine, Imitation Fruit, Lullwater Review, Marco Polo Quarterly, Rio Grande Review, RiverSedge, SLAB, The Talon Mag, Wild Violet, and several other journals. Her story “Picnics” was a finalist in Glimmer Train’s Best Start contest. She is managing editor of The Writer’s Workshop Review. She has published two dime novels, A New Plateau and Ridin’ High, through Red Dashboard Publishing. A third dime novel, part of this Santa Fe Trilogy, will be coming out in 2016. She has a novel-in-progress entitled Making It Work. It will be completed in 2016.